We launched a new line of Pilot Pens with the TV series Fashion Star.and provided a platform to build a national advertising campaign partnership. Pilot Pen tasked their media agency, Bright Red, to create a launch opportunity for the Acroball PureWhite Pens through television, which were to be positioned as a fashion accessory. Pilot Pen wanted to feature a new pen launch as a fashion accessory through a television partnership. Bright Red partnered with Hollywood Branded to source and activate the partnership. Of the wide variety of campaign ideas presented, it was determined that a partnership with NBC’s Fashion Star for its second season would be the perfect fit. 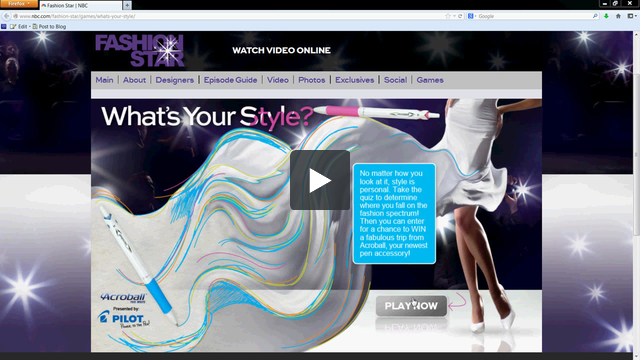 The 4 month campaign opportunity included licensing the show’s marks, creating an online game and NY grand prize fashion week experience sweepstakes component on the NBC digital platforms that would drive traffic back to Pilot Pen’s website, a digital campaign that included pushdowns, leaderboards, banners promoting the custom game and partnership, a print ad buy using the show’s licensed marks, a POS retail store partnership with Target, social media and PR components. to win a trip to New York Fashion Week. The digital campaign received over 14 million impressions and Pilot Pen surpassed all of their goals through this partnership with NBC’s Fashion Star.